yourFXguide-In my previous post, I tried to introduce COT report to the forex traders who never heard about this great report. For me it took almost couple of years to discover this report and to learn its significance in currency trading. I was able to find some market analysis tools because I was not in rush to be a millionaire, and I came to know that currency trading is not the game of kidz. I am continuously researching and searching for the tools that will help me to know the currency market in more better ways. COT report is a great tool in sentiment analysis of forex market though so many limitations are mentioned by the traders across the globe. Whenever I discover a new tool which can be applied in currency market, I generally pass a long frustrating phase until I discover some effective ways to apply the tool in forex trading. Couple of days ago I came to know about another sentiment analysis tool which is "Options Risk Reversal" strategy to predict the potential movement of the currency pairs. Still today I am trying to learn the strategy and it seems to be difficult for me because of unavailability of information. If anyone out there know about this strategy, please help me !!! 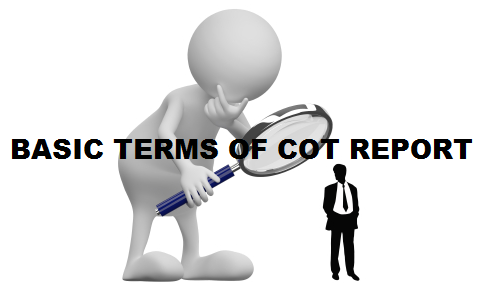 However, in this post we are going to be introduced with cot report in details. We already know cot report is published in two different formats long and short. Short format are widely used to predict the potential movement of the financial instruments through sentiment analysis. 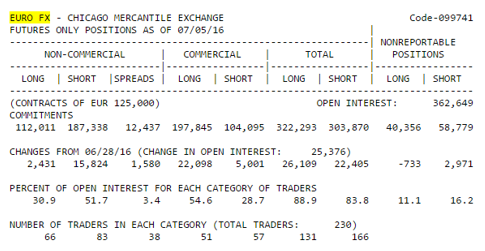 The basic terms from the short format of cot report explained below. Open Interest: Open Interest—Open interest is the total of all futures and/or option contracts entered into and not yet offset by a transaction, by delivery, by exercise, etc. Reportable Positions: Clearing members, futures commission merchants, and foreign brokers (collectively called “reporting firms”) file daily reports with the Commission. Nonreportable Positions: The long and short open interest shown as “Nonreportable Positions” are derived by subtracting total long and short “Reportable Positions” from the total open interest. Accordingly, for “Nonreportable Positions,” the number of traders involved and the commercial/non-commercial classification of each trader are unknown. Spreading: For the futures-only report, spreading measures the extent to which each non-commercial trader holds equal long and short futures positions. Changes in Commitments from Previous Reports: Changes represent the differences between the data for the current report date and the data published in the previous report. Percent of Open Interest: Percents are calculated against the total open interest for the futures-only report and against the total futures- equivalent open interest for the options-and-futures-combined report. Number of Traders: To determine the total number of reportable traders in a market, a trader is counted only once regardless [of] whether the trader appears in more than one category. Dear Traders, Hope this small post will enrich your knowledge of trading and speed up you to be a good warrior in the currency trading war. If you have any question regarding this post, you can drop it into the comment section below. I generally respond to your comments within 24 hours.